As a teenager, Sarah Gordon was told not to return to her studies and that she would never be able to live on her own. Now she has a PhD, a husband and two children. The New Zealander is currently helping the police shift their thinking around people in crisis, and she dreams of a day when her university will have a school dedicated to lived experience-based research. But bringing other professionals “out,” researchers or otherwise, remains a challenge. “I think the fact that it is most difficult for mental health professionals to disclose is incredibly sad, because it reflects the stigma and discrimination that exists within the system,” Sarah says. You can also read her guest post this week at sister site Attemptsurvivors.com. Who are you? Please introduce yourself. diagnosed when I was 17, and I was put in a mental health hospital at the time. I was there six months before I was discharged back into the care of my family, with the advice that a return to university would not be wise and that independent living would not be an option for me. paid for mental health support to enable me to go back to university. At the beginning, it was on a very part-time basis, so I did one paper per semester, and I required about 15 hours of mental health support per week to enable me to do it. As you can appreciate at that time, it was not the best cost-benefit investment. But as it turned out, over a number of years I managed to complete a bachelor of science, which I majored in psychology, a law degree, which I majored in health law, a masters of bioethics and health law and a PhD in psychological medicine. But more important than any of that, I don’t live independently, I live with my husband and two children. And now I work for the department of psychological medicine, University of Otago in Wellington, New Zealand. My job is what I describe as a “service academic.” I use my personal experience of mental illness to inform all the research and teaching undertaken by our department. How did you come to be talking with me? For a number of years after I was diagnosed, I was very secretive about my experience and didn’t disclose very much at all. In 1998, I happened to get a job as a consumer adviser to a mental health service. It was very clear when I went for that job that my personal experience with mental illness was a qualification to do the job. And yet, I didn’t fully appreciate what that meant. Essentially, everyone I came in contact with knew that I had personal experience, purely as a result of my position title. At the beginning, I found that very difficult, because I felt that people responded to me in a way that was quite different to those situations where people didn’t know. But I came to see overcoming that stigma and discrimination as a real challenge and one that I actually ended up enjoying. And my work since then has always involved me using my experience in my work. And so that’s maybe how you became aware of me. I heard of you during my interview with Louise Byrne. What is the lived experience community like there? Is there an attempt survivor community at all? meant that we have less influence than we may have had some years ago. I think there were a couple of things. One is that the government dropped mental health as a health priority. And the second was that our mental health commission was dis-established. That seems unusual. Was it a budget problem? health commissions have been established. I think New Zealand was seen as leading the way in many respects prior to this, and now I certainly wouldn’t consider us to be in that same position. How have reactions to your experiences changed over the years? experience, people then feel safe to expose and share their difficulties and struggles, often, I believe, with a great sense of relief. Do you like that? Or do you get too much of it? Did he know what you were talking about? No, he looked even more bemused. Being so open and public, do you ever feel like you have to hide a bad day? What would you like to change about the mental health care system? distress there, and it takes support that involves a lot of time and effort for the person to get through that. And I think ultimately it needs to be focused on social roles and relationships. And we just don’t do that. How are people treated now? compulsory treatment, seclusion, those sorts of things. And in most cases, medication will be the first and often the focus of the treatment. What would the ideal treatment look like? emotional distress and very often is very disconnected from most things in their life that are very important. And so our supports need to be focused around supporting the person until whatever is distressing them can be resolved. Support to reconnect is imperative, particularly in terms of those relationships that are important to the person. What arguments have you had to make in your career to prove that you could do what you were pursuing? that person comes to appreciate and recognize the value lived experience can bring. And as a result, some people have been really quite staunch supporters of both my involvement and the involvement of others who come from a personal experience perspective. How to make suicidal thinking a less scary topic overall? Is this something the media should take on? I think absolutely the media needs to be involved. Tell the stories that people can get through it and people can recover. Those are the most important stories that we need to get out there. What are you working on now, and what would you most like to accomplish? pathologizes the distress and more toward supporting the police to learn about what might be going on for people when they’re experiencing this type of distress, and the approaches that can be most supportive in those situations. That’s exciting. Going forward, my dream is for our university to have a school dedicated to lived experience-based research, where we can start building a really significant and substantial amount of knowledge that is informed by people’s own experiences of both distress and recovery. In the police project, what have been some of the more striking questions or observations? distress. I have to say that the people leading that project from the police have been incredibly receptive to what we are proposing from a service user perspective. Can you tell me about the International Association of Service User Academia, and how and why it came about? Association, a Mendeley-based e-network, in 2012 to enable service user academics and their supporters to engage in topical discussion, share experiences, enhance collaboration, keep abreast of advancements and exchange information. In general, how do we get others to disclose their experiences, since they’re all around us but silent? I think the fact that it is most difficult for mental health professionals to disclose is incredibly sad, because it reflects the stigma and discrimination that exists within the system. I suppose the only thing that’s going to change that is more people disclosing, and actually requiring the system and attitudes and beliefs to change as a result of that. Are you happy with where you’ve come to in life? how I do it and where I’m at. What made your parents so stubborn and “not compliant” after hearing that you would have no more education or independence? approach to mental illness is, without them even knowing it. What does your family think about all of this? needed to overcome to get to this place. Finally, who else are you? a variety of different organizations and associations. So life is pretty full. And that’s good. We couldn’t resist this photo of Rohan Kallicharan with an example of his starring role in a mental health campaign displayed in the London transit system. How many public awareness messages have you seen with a real person identifying as someone who tried to take their own life? Intrigued by this relative openness in the UK and the engaging nature of the large mental health charities there, we checked in with Rohan, who spends his time working as a recruiter, taking seriously long-distance runs and enjoying football of all kinds, including the NFL. My name is Rohan Kallicharan. I’m based in Birmingham in the UK. I turned 40 last month. Since I was in my late teens, I displayed symptoms of mental illness. I never got the diagnosis of bipolar until after I had taken two overdoses, the second of which was in 2006. So for a long time, I was mistreated, undiagnosed until I was 32. From there, it was a case of taking baby steps, rebuilding my life from scratch to where I’m now mentally and physically healthy, and very happy. You’re now the face of a national campaign. How did you get into that? As I said, I twice tried to take my own life. After my second attempt, there were two places I turned to for help. I was very lucky get some private counseling, one of my mum’s employee benefits, but the other very important source of help with was Mind, the mental health charity. It was their branch in Manchester who at the time gave me one-on-one and group support, which really allowed me to, for the first time in 15 years, realize I wasn’t a freak, this bad apple and really horrible person I had begun to believe that I was. I realized my only problem was that I had a really serious illness. I began through Mind to be able to speak to other people who had things in common. That was the biggest single step in my life in moving forward, accepting myself again. I had hated myself for so long. To find a group of people around whom I was accepted made me feel normal again, human. It was the most incredible thing. It gave me the strength to start rebuilding my life. Mind played a huge part in rebuilding my life from where I was absolutely broken. Mind more than anyone helped me to rebuild. So when last year I’d become very overweight, about 19 stone (now I’m 12 stone, but that’s another story), I decided to start running so I could raise money for them. It’s all really gone from there. In the last 12 months, I’ve been involved in fundraising and, to this point, I’ve raised over five and a half thousand pounds, with another 3,000 guaranteed from the US-based chain of fitness clubs Anytime Fitness. I went from not being able to run a bath to running the London Marathon, which was the greatest experience and achievement in my life. Next step, New York … well, hopefully one day! That’s how I got involved with Mind again, fundraising. However, because of things that I had written on my own blog, I also started doing some writing for Mind and Time to Change. Time to Change is a joint venture campaign aimed at reducing stigma. It’s National Lottery funded, run by Mind and Rethink, the two most significant mental health charities in the UK. Through that writing and fundraising, I applied to and was invited to take place in a photo shoot last October, through which I became a “Face of Mind.” It is an unbelievable honor. I was humbled by it. It’s just really, really humbling to be able to give back to a charity responsible for me being alive today. I wouldn’t be here without them. After that second attempt, I remember lying there and I knew full well this couldn’t go on. I was playing Russian roulette with my life. If I wasn’t treated, there would have been a third or fourth attempt, but I had barely survived this one. Without Mind, I’m not alive today, it’s that simple. To be able to give back is just the most incredible thing, and I know they really appreciate it. However, they don’t realize the thanks are all from me. It’s a two-way thing, and it’s nothing to give back to the people who have given me my life. How did you find them in the first place? What was your motivation to reach out? The only person was my mum, which meant that after being in denial for so long, I had no choice when I rang from the hospital and said, “Can you pick me up? I’m in the hospital, I took an overdose, I have a problem, I need help very badly.” It was the first time I had done that. I had been living with this since I was 17, I just thought I was a really bad piece of work, you know. I didn’t know it was a mental health problem. By opening up, I was able to seek help. I had five sessions with a counselor, which were great. The first five were free. He then gave me a couple he didn’t charge for. After that, I remember turning around and saying, “How much does it cost to continue?” and he said, “You don’t need me anymore.” “How do you mean?” I responded. He said, “You’re working this all out, you don’t need me anymore.” I said, “Nah, no way.” He’d become my crutch. I think he sensed I’d done the hardest work already, getting in touch with my feelings, facing my demons in the eye, but he also knew I needed that something to lean on, so he signposted me to Mind. Although Mind is a massive charity, mental health is something nobody wanted to talk about, so it still was not in my field of vision. I didn’t really know about them. Everybody knows Cancer Research, AIDS charities, Oxfam, the Red Cross, all the big ones. But when it comes down to Mind and Rethink, you know they weren’t charities people spoke about, because they don’t talk about mental health. It was only through the counselor that I turned up at their door. And they put you in a group with others? Yes, and through that networking I suddenly realized I wasn’t alone. And you know what? When you live your whole adult life thinking you’re the only one doing these things, this is a massive relief. Bipolar is a horrible thing. You live life on a roller coaster, doing things out of fake confidence, feeling invincible, on this high wanting to party the whole time, then suddenly the things you do make you ashamed when you go down into the depressive period. It has an even higher rate of suicide than any other mental illness, and that’s because you cannot sustain this absolute roller coaster. I’d lived life from 17 to 32 being ashamed. There are no words that can describe how much I despised myself. I could see the hurt I was constantly causing others by my behavior. I just thought I was a really bad apple, that I was, excuse my French, messed up. I’d use slightly stronger language if I could, but I’m not going to. You know, it was only after I realized, “Actually, no, I’ve got this serious illness, and there are other people with it as well,” that I had the peace of mind to know that I could overcome it, that I was gonna come through. From there, I got to that point at the beginning of last year where I was desperate to make a difference in the lives of others. I want to make a difference. I nearly lost my life because I sat in silence in a prison for 15 years of four walls and darkness. And because of that, I nearly lost my life. I don’t want anyone, ever, to feel scared of talking. I want to be a voice for those too scared to speak out. What have been some of the more striking responses? Ninety-nine point nine percent of people absolutely are totally supportive. If you read my Twitter feed, I sometimes have an aversion to what we call the I-word, “inspiration.” That’s one I’m constantly described as. However, I still look in the mirror and see what’s beneath, and I know I’m far from perfect. What stands out to me is knowing I have made even a small difference: Seeing a a couple of colleagues, friends, put their hands up and say, “I’ve got a problem.” It’s getting an email from a family friend a few weeks ago saying, “I had no idea, and I’m so proud of you.” It’s getting a message from a friend at university, our friendship had been destroyed by my behavior in the excesses of manic periods, saying, “I wish I had have known.” A complete stranger on Twitter saying, “You saved my life.” All of those things and more. And you know, I’d love to lead a really private, quiet life. Because that’s who I am, quite shy, introverted, but the minute I chose to be a champion, I gave that right up because I’m committed to speaking, to putting myself out there, committed to ending stigma. Obviously, I’m not doing it alone. Look, the way I see it, we all have a sphere of influence as individuals, if we can all influence our networks, and then those of others around us as a knock-on effect, we can do this thing. Mind saved my life, and I’m just committed to ensuring they continue to save others. It really is that simple. We live in such a cynical world that people are looking for an agenda, but there really is no agenda for me. It’s so simple. We all have a right to live a happy life, a right to not be judged, to not be scared to speak out, to be healthy mentally and physically, and yet so many people are afraid to exercise that right for fear of being stigmatized. Have you ever felt pressured to censor yourself when talking about your attempts? Very rarely. There are certain words that charities prefer you not to use. I don’t talk about “failed” suicide attempts and don’t perhaps go into detail about those attempts. You’ll notice I used the word “overdose,” and that’s as much as you need to know. I don’t talk in graphic detail, I think that’s the only thing for me. Other than that, I feel I can be very open. But again, I’ve got a very thick skin. 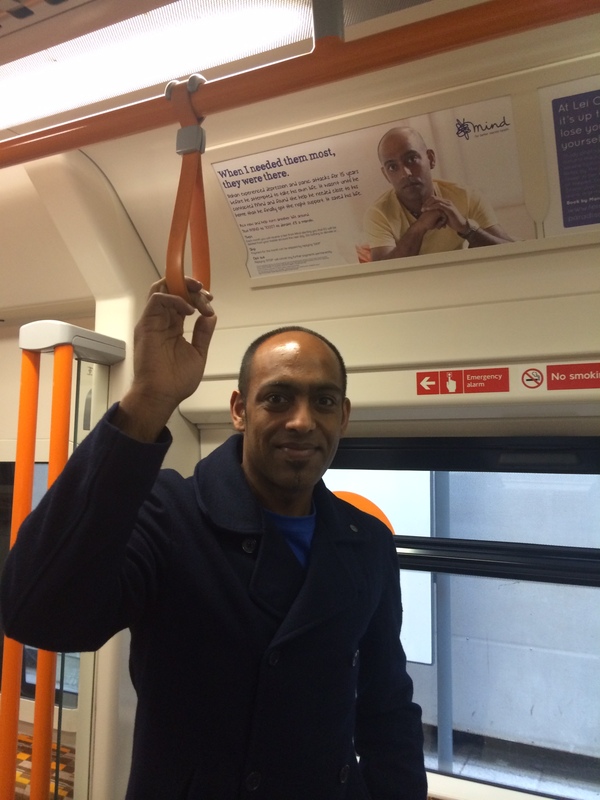 Look, at the end of the day, there’s posters on the London Overground saying I attempted suicide. I can’t hide from that. I was in a national paper in February telling people about my story, so there’s no hiding place for me. I have absolutely no fear in what I say. The charities are very good in terms of non-censorship, but they’re rightly very wary of the audience that reads them and absolutely avoid any triggering language. So obviously, I’m conscious of that, you don’t want to give ideas to someone suicidal about what they might do. If/when suicidal thinking comes back, how do you deal with it? And as the “face” of a public campaign, do you feel any pressure to be “OK” all of the time? I have not experienced suicidal thoughts for a long time, although I am still prone to severe depressive episodes. The difference is that where I once suffered in silence, I now tell people very openly that I am going through a difficult period. For so many people with mental illness and mood disorders, knowing that they can speak to someone makes the biggest difference. As a face of Mind, I am very open about when I am struggling. Mind and Time to Change are really trying to get the message across that it is OK not to feel OK, so I feel no pressure at all in that regard. Is there any kind of suicide attempt survivor movement in the UK? There are a lot of smaller groups. For example, Forward For Life, they’re based around suicide prevention training. So that’s huge. There’s also Dr. Alys Cole-King, doing a lot of work. A lot of what I see is on the social media sites, there’s a huge amount going on there. What we have to remember is that social media is the merest, smallest microcosm of life. It’s not useful in areas where people can’t get to the Internet. You have to make sure messages are getting out to people who really need them. That’s what I don’t know, I have to question whether we’re really doing that, although it’s not a question of lack of effort. Take, for example, New York. I have family in Queens, where there’s a big Caribbean community. And in those Asian and black communities, there’s always been massive stigma around mental illness, and likewise here. In the States, there’s an even bigger melting pot when you consider Hispanic communities also. We’re talking about huge stigma. Time to Change is doing a lot of work around what we call BME, black and minority ethnic communities. It is a massive area we really need to engage. How do you even start the conversation when some people would rather just walk away, avoid it? You know what, sometimes you have to take a step back … I’m not being defeatist, but if someone is not ready to listen yet, there’s no point in forcing it, because it will push them further back. It’s all about being approachable and just planting the seed and saying, “OK, I understand you don’t want to talk, but if you want to at some point, this is where I am.” It’s about signposting and making them aware. They might not want to talk to you because you now know who they are, but they might want to speak to a stranger. Let them know that if they want to talk, there’s somewhere to go. I did a radio show in March for the BBC Asian Network. A lady phoned in, obviously in huge distress, very powerfully emotive. We didn’t want to let her off the line. In the end, the people in the studio were able to give her support numbers. To help someone, they have to want it. I always look back on my experiences. If you had tried to force help on me, I would have rejected it. I found that a hugely traumatic and triggering experience. I can empathize, but actually my skills are in campaigning, fundraising, advocacy, not necessarily counseling, but I will always do my best for people. Does that make sense? … I was looking into training for the Samaritans, and a friend said, “It’s not for you.” After last week, I said, “My God, you’re so right.” Someone like you or me, we’re too tempted to draw on our own experience, but each person’s experience is totally different. We can empathize, but that’s actually as much as we can do. The key is knowing where and how to signpost. Every week without fail, I get calls and messages from friends saying, “I have a friend with a problem” … and I signpost them to relevant people. That’s the best advice I can give them. What’s your take on peer support? That’s a really tough question. I think peer support is massive, but shouldn’t ever be confused with crisis care. Peer support is listening, understanding, empathizing, but never crossing the line of trying to treat. That’s a skill in itself. It’s knowing, “Where do I stop?” So yeah, look, just as I was explaining, I’m constantly approached by people, which is why I’ve done what I have, to get people to speak up. It doesn’t make me happy when a friend calls to tell me about someone in severe crisis, but I’m relieved they approach me. It’s knowing where that place is to stop, and I’m getting pretty comfortable with that. The model Time to Change uses is the lived experience model. We’re using that in advocacy and championing, saying, “I’m an example that you can live through this.” Or, “I’m still here. I’m someone who really understands.” The same reality is however true even with that, it’s knowing where you stop and where someone who’s qualified to help takes over. What is the Mind manifesto, for us outside the UK? Next year is General Election in the UK, so Mind has produced a manifesto to lobby political parties. It’s on their website, saying, “Look, mental health has to be on the political agenda for these elections.” It has to be there. I’ve lobbied my own member of Parliament. Great. It’s not quite meeting with a senator for a coffee, but I’m meeting with an elected member of Parliament to talk about mental health. It is a small step in the bigger picture, but a massive one for me. Rip out the whole bloody lot and start again when it comes to crisis care. The system is just broken, Cara, I can’t begin to describe it. The system is failing people left, right and center. People are not getting admitted when they need crisis care. It starts with GPs who, unfortunately, cannot be expected to have specialist knowledge around mental health, they’re called General Practitioners for a reason, so all many of them want to do is prescribe everyone anti-depressants. That doesn’t work! They’re reluctant to throw people into the crisis care system because it’s so understaffed, and even on occasions when they recommend people to counseling, there are waiting lists for forever and a day. It’s taking people to attempt suicide before they take notice, and even then they don’t take notice half of the time. The system is so broken. It’s absolutely scandalous. There aren’t enough beds or staff, not enough knowledge. People want a one-pill-fits-all solution. The system is a joke. And people are going to die if they don’t sort it out. And that’s why it’s got to come from the government. There’s got to be an edict on change. I’m sorry, I’ll get off my soapbox in a minute. Look, I give the example. When I took my first overdose in 2003, I was kept in the hospital overnight for obvious reasons. They wouldn’t release me until I saw someone from the crisis team. But they were too busy. On the second day, they were still too busy. So I had a 10-minute meeting with a nurse. “Are you gonna do it again? '” “No.” “Off you go, then.” There are people being let back out who can be a danger not only to self but to others. And that’s where you get sensationalist headlines, and people get exactly the wrong idea of mental illness, and start stigmatizing. But the bottom line is, the system is failing people. We say it constantly, one in four people will live with mental illness at some point in life. If we as the National Health Service can’t deal with an illness that’s gonna effect one in four, we have a massive problem. Where do you see hope? I see hope because there are so many tragic stories, so for all the wrong reasons, in a way. However, I see that hope because people are beginning to understand how serious this thing is, because more and more are being affected, losing family members to suicide, seeing family members suffer from depression; that shouldn’t bring hope, it should bring despair, but it brings hope because people are standing up and saying this a real, real problem. I see hope that a generation of teenagers in this country are now seeing friends suffer from self-harm and depression and see that nobody is listening, but these kids want a voice. They want to make a difference. If they can just be empowered to speak out, they will change future generations. I’m absolutely convinced of that. That’s why charities have got to engage with these youngsters who desperately want to speak out and want to be heard. They want people to know, “We’re struggling here, but because I’m a teen you think I don’t understand life. Well, I do. Listen to me.” They’re the ones who will create the future. They’re the ones who will eradicate stigma. Any interest in running for office yourself? Not for me. I’ll keep up my soapbox on the Internet and continue to campaign and fund-raise. Anything Mind asks of me, I will give them my life. They’ll never ask for my life, but I’ll give them every ounce of energy I have, because everything I have is because of them. Is this work your career? This is all in my spare time. I work very long hours every day as a recruiter. I work for a consultancy, so I place people into jobs mainly in procurement and purchasing. OK, I’m Rohan, a recruiter, Rohan, a massive NFL fan up all hours of the night and early morning despite the time difference in the States, a Redskins fan. A massive sports fan, which probably ties in with my running. I’m a season ticket holder at Liverpool Football Club (soccer to you guys! ), and I’m a runner. And you know what? I’ve run out of hours of the day after that. I love my family and friends, I’m a devout Christian. As a Christian, I believe God gives us a calling. For me, my calling is speaking out about mental health. I’m very passionate about what I do.